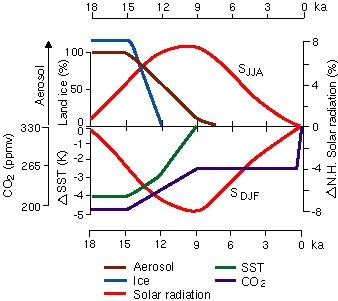 a large increase in the concentrations of carbon dioxide in the atmosphere (Fig. 1). Figure 1. Changes in global "boundary conditions" that influence the Earth's climate since the Last Glacial Maximum (modified from Kutzbach and Ruddiman, 1993). Shown here are the conditions used to initialize a series of numerical climate model simulations employed by COHMAP (Cooperative Holocene Mapping Project) to explore large-scale changes in the Earth's climate. During the last Ice Age, the southwestern United States was much wetter and cooler than it is today. In the Great Basin deep fresh-water lakes covered many of the now arid valleys (fig. 2) and the current Southwestern deserts supported plants and animals that are now restricted to higher elevations and more northerly latitudes (see "Land Use History of North America (LUHNA): The Paleobotanical Record"). Conversely, many of the modern desert species apparently could not live in this region and were presumably displaced southward to warmer climates. The massive Laurentide Ice Sheet that covered most of Canada and much of the northeastern United States apparently had a large effect on atmospheric circulation and pushed the westerlies far to the south relative to today. Consequently the southwestern United States received abundant precipitation throughout the year (Thompson and others, 1993). Figure 2. The relative depths of Pleistocene Lakes Lahontan (which covered western Nevada), Russell (modern Mono Lake, California), and Bonneville (which covered northwestern Utah). During their deepest phases, these the waters of these lakes covered modern desert valleys with waters tens to hundreds of feet deep (modified from Benson and Thompson, 1987). Figure 3. Effective moisture in the western United States (relative to today; modified from Thompson and others, 1993) for the Last Glacial Maximum (18,000 years ago [18 ka]), the late glacial period (12 ka), the early Holocene (9 ka), and the middle Holocene (6 ka). These reconstructions are based on lake level, fossil pollen, and packrat midden data. Wetter-than-modern conditions continued into the early Holocene (fig. 3), although the cause was apparently different than during the late Pleistocene. During the period of maximum summertime solar radiation (and after the bulk of the Laurentide Ice Sheet had wasted away; fig. 1), the summer monsoon of the Southwest was apparently much stronger than it is today. This enhanced circulation apparently brought enough rainfall and cloudiness into the Southwest so that cool-adapted species could survive in the modern deserts. However, at the same time there is evidence that timberlines were higher than today at (or near) this time, suggesting warmer-than-modern summers at high elevations. Climatic conditions in the southwestern deserts became warmer and drier by the middle Holocene, and many of the modern desert species became established within their modern ranges since 6000 yr B.P. Information on late Pleistocene and Holocene vegetation changes in the southwestern United States comes from the study of the urine-cemented "middens" of ancient packrats (Neotoma spp.) and of fossil pollen preserved in lake and cave deposits. 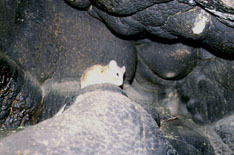 Packrats collect pieces of plant material, bones, and other items in their environment and bring them back to their nests. The collected items are then cemented together by the animals' viscous urine. Frequently this occurs within dry caves and rockshelters where the fossil "middens" can be preserved for tens-of-thousands of years. Figure 4. A modern packrat (Neotoma cinerea) in a cave in northwestern Nevada. Click to view a larger image. Figure 5. 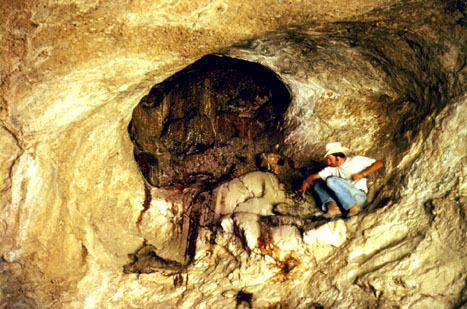 A massive complex Pleistocene packrat midden (in the alcove in the center of the image) in a cave in eastern Nevada. Click to view a larger image. Figure 6. 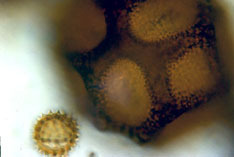 Pollen grains of a species in the Asteraceae (sunflower family; the smaller grain on the left) and a species in the Cactaceae (cactus family; the larger grain in the background). Click to view a larger image. The plant remains recovered from these deposits are perfectly preserved and can usually be identified to species. The plant fossils provide excellent material for radiocarbon dating, and fossil midden assemblages provide detailed inventories of the plants and animals that lived at the collection site for discrete points in the past (for further information, see Betancourt and others, 1990). Fossil pollen provides a more generalized view of past vegetation, as most pollen grains can be identified only to plant family or genus. In the following text we review the known past distributions for three past time periods of selected plant species from subalpine forest, woodland, steppe, and desert vegetation associations. Figure 7 illustrates the locations of packrat midden and fossil pollen sites used in these reconstructions. Figure 7. Site locations used in the maps below. Green triangles indicate the presence (large solid triangles), rare occurrence (small solid triangles), or absence of the plant in packrat midden assemblages. Red circles indicate the relative abundance of the taxon in fossil pollen assemblages (the size of the circle indicates the percentage of the taxon). Figure 8. Spruce (Picea engelmannii and Picea pungens). Subalpine trees such as spruce were present in the Great Basin, Grand Canyon, and central Arizona during the Last Glacial Maximum (18,000 yr B.P. ), but at elevations as much as 1000 meters lower than these species occur today. Spruce was apparently absent from its modern range in the Rocky Mountains of central Colorado at this time, probably because of cold and dry conditions. By the late glacial period (12,000 yr B.P.) 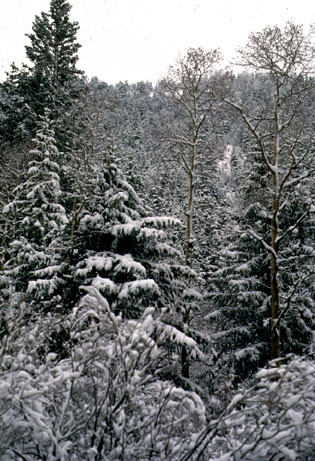 spruce had begun to disperse northward and to higher elevation, although it survived at sites that are lower or farther south than it lives today. At 6000 yr B.P. 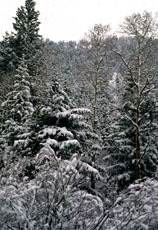 spruce was approaching its modern range limits. Indeed, spruce and/or other subalpine trees lived at higher-than-modern elevations from Colorado to California during parts of the early and middle Holocene. was both warmer and wetter than today". (Fall, 1985; figure modified from that report). Figure 11. (see below) Click to view larger image. Figure 12. Subalpine trees in the Sierra Nevada remained as much as 65 m above modern timberline until 3500 yr B.P. (Scuderi, 1987). Figure 11. 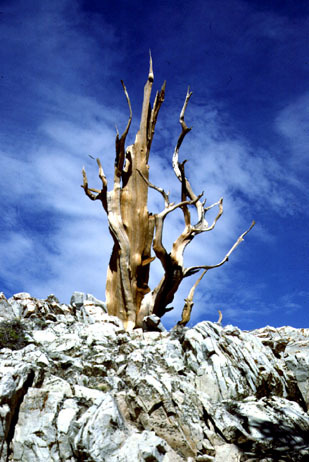 A standing snag of a bristlecone pine (Pinus longaeva) above modern timberline line in the White Mountains of eastern California. 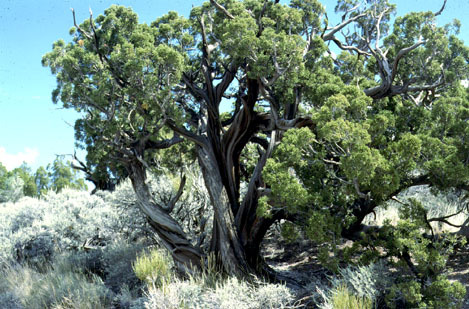 During the middle Holocene, this drought-tolerant subalpine tree lived as much as 150 meters above its modern elevational limits (LaMarche, 1973). Upslope dispersal of this and other subalpine species, as well as increased rates of tree growth at high altitude, may reflect either warming temperatures and/or response to increased atmospheric carbon dioxide concentrations (LaMarche and others, 1984). Figure 13. Packrat midden evidence indicates that pinyon pines (Pinus edulis and Pinus monophylla ) lived in the modern southwestern deserts during the last glacial maximum (18,000 yr B.P.) until at least late glacial time (12,000 yr B.P.). These pines lived at much lower elevations than they do today, and they lived in association with plants that they do not commonly occur with today (see the chapters by Van Devender in Betancourt and others, 1990). 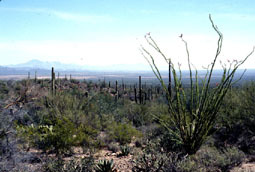 Most of the hallmark species of the Sonoran and Chihuahuan Deserts were absent from these regions during the late Pleistocene. By the middle Holocene (6000 yr B.P.) pinyon pines, junipers, and other woodland species were approaching their modern range boundaries. Figure 14. Big sagebrush (Artemisia tridentata ), closely related species, and other steppe shrubs apparently maintained much of their current ranges during the late glacial maximum and late glacial (18,000 and 12,000 yr B.P.). At the same time they inhabited sites farther south and at lower elevation than today. By 6000 years ago steppe plants were approaching their modern range limits. Figure 15. Utah Juniper (the tree on the right) with big sagebrush (gray-green shrubs on the left) growing today in the eastern Great Basin. During the late Pleistocene these plants grew in the modern Sonoran and Mojave Deserts. Click on the image to view a larger version. Figure 16. Creosote bush (the low olive-green shrubs in the foreground on the left) growing with ocotillos, palo verdes, agaves, and saguaros in the modern Sonoran Desert of southern Arizona. Click on the image to view a larger version. Figure 17. Creosote bush (Larrea divaricata:) is the most widespread of the shrubs of the modern hot deserts of the southwestern United States. It occurs from central Mexico across the Chihuahuan, Sonoran, and Mojave Deserts. It was apparently absent from the Southwest during the late Pleistocene (18,000 and 12,000 yr B.P. ), and although it was present in this region by 6000 yr B.P., it had not attained anything approaching its modern range limits. In the long-term perspective, climate is constantly changing. In the 18,000 years since the last glacial maximum the southwestern United States has experienced conditions that ranged from much colder to somewhat warmer than today. Moisture conditions have also varied, both through time and across the region. Plant species have reacted to these climate changes by adjusting their geographic and elevational ranges, along with other strategies not discussed here. Future climatic changes can also be expected to cause changes in the distributions of plant species, and the rate of change could potentially be much faster than those seen in the last glacial-interglacial cycle. Benson, L., and Thompson, R.S., 1987, The physical record of lakes in the Great Basin, in Ruddiman, W.F., and Wright, H.E., Jr. (eds. ), North America and Adjacent Oceans during the Last Deglaciation: Geological Society of America, Decade of North American Geology series, p. 241-260. Fall, P.L., 1985, Holocene dynamics of the subalpine forest in central Colorado. in Jacobs, B.F., Fall, P.L., and Davis, O.K. (Editors), Late Quaternary vegetation and climate of the American Southwest. American Association of Stratigraphic Palynologists, Contributions Series No. 16, pp.31-46. Kutzbach, J.E. and Ruddiman, W.F., 1993, Model description, external forcing, and surface boundary conditions, in Wright, H.E., Jr., Kutzbach, J.E., Webb, T. III, Ruddiman, W.F., Street-Perrott, F.A., and Bartlein, P.J. (Editors), Global climates since the last glacial maximum: University of Minnesota Press, pp. 12-23. LaMarche, V.C., Jr., 1973, Holocene climatic variations inferred from treeline fluctuations in the White Mountains, California. Quaternary Research, v. 3, pp. 632-660. LaMarche, V.C., Jr., 1984, Increasing atmospheric carbon dioxide: tree ring evidence for growth enhancement in natural vegetation. Science, v. 225, pp. 1019-1021. Scuderi, L.A., 1987, Late-Holocene upper timberline variation in the southern Sierra Nevada. Nature, v. 325, pp. 242-244. Thompson, R.S., 1990, Late Quaternary vegetation and climate in the Great Basin, in Betancourt, J.L., Van Devender, T.R., and Martin, P.S., Packrat middens; The last 40,000 years of biotic change: Tucson, AZ, The University of Arizona Press, p. 200-239. Thompson, R.S., Whitlock, C., Bartlein, P.J., Harrison, S.P., and Spaulding, W.G., 1993, Climatic changes in the western United States since 18,000 yr B.P. in Wright, H.E., Jr., Kutzbach, J.E., Webb, T. III, Ruddiman, W.F., Street-Perrott, F.A., and Bartlein, P.J. (Editors), Global climates since the last glacial maximum: University of Minnesota Press, pp. 468-513.